Gardendale() It seems that Birminghamster Phil Sorreta failed to receive a single "LOVE-LETTER" during a recent outbreak of the malicious email. Sorreta works for a company which uses the popular Microsoft Outlook product which was targeted by the "LOVE-LETTER" malicious email. Everyone else in the company apparently received multiple copies of the "ILOVEYOU" messages in their respective inboxes. The only way Sorreta could have avoided receiving one himself is if he was on no one else's mailing list. This has caused Sorreta great concern as he ponders his situation. A routine check shows that Sorreta is not even visible on the Global address list. It is obvious that no one indeed loves Sorreta. Homewood() Local barbecue officionado Lionel Hicks received more than he bargained for in his barbecue sandwich today. Dining at the same establishment he has frequented for the past twelve years, Hicks was surprised to find some inside meat in his usual outside meat chopped sandwich. "I mean I didn't think I had to say 'no inside meat' after twelve years!" 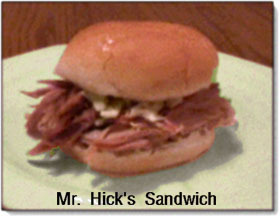 When told that there simply was no more outside meat available at the time, Hicks continued eating his sandwich because "I was late for a meeting already and didn't have time to argue." Downtown() Birmingham mayor Bernard Kincaid, and former Decca recording artist James Brown have announced plans to hold a summit during this year's City Stages event. A tentative schedule for the summit includes forums on the topics of Urban Sprawl, Globalization, and Youth Education. Says Brown, "I have been sprawled all over the place from the ghetto to the barrio to my home in Georgia. In general this ain't a good thing." Speaking to globalization, Mayor Kincaid points out the extreme pressure he received from foreign car makers during his bid to purchase a Lincoln Town Car. "There is no way I could purchase a car made under the conditions that exist in some of these third world countries. I couldn't be seen driving through North Birmingham, and Gates City in an automobile produced by workers held under the thumb of big boss cronyism." As for Youth Education Brown believes that if he can convince today's youth not to make the same mistakes he has made then he will be covering a good bit of territory. The summit will take place as part of the Spoken Word Festival at City Stages. "I can't think of a better venue for get-down, jivin, off the wall ideas," said Brown. Mayor Kincaid then proceeded to invite Brown to a Birmingham City Council meeting while the singer is in town. "If we can get him in there, we can really solve some problems." Crestline() Earlier this evening, Crestline resident John Morris neglected his cat in order to perform some unsolicited art direction for Birminghamania(c) publisher Mark Ausborn. Unable to let the awkward pixelation of "sandwich.gif" along with its small caption detract from the accompanying story about a barbecue incident, Morris took it upon himself to "right-click" the image and save it to his hard drive for modification. With the image opened in PhotoShop 3.0, Morris was able to convert it to RGB mode, increase it's size enough to blur out the 256 color compressed image into a million-possible-color smooth gradient tone. Morris did not stop there, however. He went on to adjust the contrast level to highten the immediacy of the sandwich's "objectness" (a term Morris defines as "the quality by which an object appears as such, even in a representational medium"). Still displeased, Morris went on to replace the dull pink color of the plate with a soothing green - a color he chose because it effectively contrasted the pinkness of the sandwich's unfortunate preponderance of "inside meat". This created a minor problem for Morris, as the shift in hues made the sandwich's cast shadow appear grossly saturated in vivid green. He selected the area of the shadow and "desaturated" it, giving the sandwich even more "objectness" by backgrounding the context. He then retyped the caption to reflect the increased resolution, thereby completing a process during which the illustration - formerly a rather lukewarm presentation of fact - became an effective illustration for the article. There is no word as yet what Morris may have planned for the Birminghamania(c) logo, which to him resembles a particularly ill-conceived logotype used by the Birmingham Zoo shortly before it fell into disuse and disrepair. "I dunno," commented Morris, "I just think it could use some spice."